The Huskies had no players score in double figures in losing for the 18th straight time on Stanford’s home floor. STANFORD, Calif. — Alanna Smith scored 11 of her 27 points in the third quarter and also grabbed 13 rebounds as No. 6 Stanford beat cold-shooting Washington 91-54 on Friday night for its 19th straight home victory. 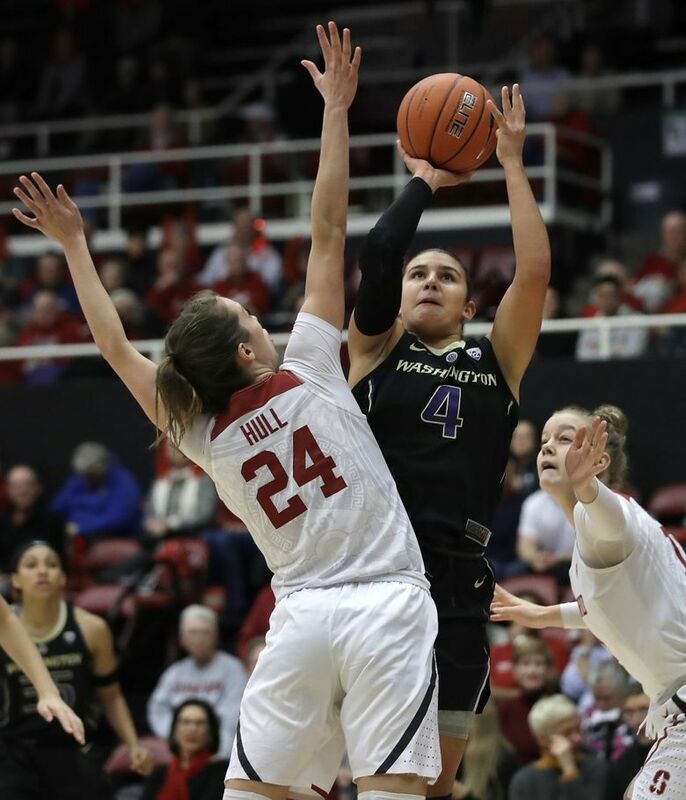 Kiana Williams scored 22 points and knocked down four of 13 three-pointers by the Cardinal (15-1, 5-0 Pac-12), which beat Washington for an 18th straight time at Maples Pavilion. Smith shot 12 for 18 and has all five of her double-doubles this season over the past seven games. Now, Hall of Fame coach Tara VanDerveer will look for her 900th win in 32 seasons at Stanford when her team hosts Washington State on Sunday, having never lost to the Cougars. DiJonai Carrington contributed 12 points, 11 rebounds and five assists for Stanford, off to the program’s best start since beginning 22-1 in 2013-14. Amber Melgoza was held to nearly 11 points below her average, scoring eight points and committing five turnovers for Washington (8-10, 1-5), which didn’t have a double-digit scorer in losing for the seventh time in eight games. The Huskies shot 34.5 percent, going 8 for 26 from three-point range. Missy Peterson and Khayla Rooks scored nine points each for Washington. Jenna Moser added eight points. The Cardinal made its initial five shots, jumped to a 12-2 lead and rolled.